Despite Parkland being more than 1,300 miles away from Newtown, the shooting hit close to home for many local residents, having been affected by 12/14 just over five years ago. More than 40 people attended the session to brainstorm what they can do to support the most recent grieving community and learn how to take part in upcoming initiatives to end gun violence. The attendance at the public event exceeded the amount initially anticipated, causing the meeting to move from a small meeting room into a larger adjacent room as supporters continued to arrive. NAA Chairman Po Murray opened the meeting saying she felt it was necessary to have everyone come together, because after the school shooting in Parkland many people began reaching out to the group asking what they can do to help. She explained that even though Newtown Action Alliance is entirely volunteer based, created after 12/14, it is a “labor of love” that has given Newtown a strong voice “to change hearts and minds” on gun violence prevention. NAA Vice Chairman Dave Stowe gave background information on the group’s efforts and detailed some legislature on guns in America, saying, “The state of the gun laws in this country is truly appalling,” and the fact that laws change state-by-state has real consequences for everyone. He said that is why NAA is active in making trips to Washington, DC, and is constantly advocating for a comprehensive set of gun laws to protect people. NAA currently has 23 proposals for Congress on ways to reduce gun violence, and has even written a letter to Florida Governor Rick Scott to urge him to ban assault weapons. Mr Stowe explained that in addition to the group’s activism with changing legislation, members also established The Newtown Foundationafter 12/14 to help support victims of gun violence and have created an annual vigil to help those affected come together and receive community support. Ms Murray reminded those in attendance that the young generation of students in school are becoming a strong voice of change, especially after Parkland, which has ignited the nation’s passion for gun violence prevention more than ever. Two leaders from the Junior Newtown Action Alliance — Jackson Mittleman and Tommy Murray, Ms Murray’s son — spoke at the community meeting to represent the youth who are active about making change. Jackson informed the crowd they scheduled a community vigil in honor of the Parkland victims for Friday, February 23, from 6 to 7:30 pm, at Newtown High School’s Blue & Gold Stadium, 12 Berkshire Road. The vigil will have a variety of speakers, including students, and will have school security present at the stadium and in the school building. The Junior Newtown Action Alliance will also be organizing a nationwide school walkout being planned for Wednesday, March 14, at 10 am. Tommy explained that they are fortunate in that the Newtown High School administration has been very supportive and has allotted the students a specific time to walk out without being penalized or suspended for doing so. The walkout will be 17 minutes long, one minute in honor of each victim last week’s Parkland shooting. When an audience member said that they heard it was taking place on another date, Ms Murray explained that there is an upcoming walk called March For Our Lives on Saturday, March 24, in Washington, DC. March For Our Lives is planned to be an organized youth movement that will be similar to the Woman’s March. It originated from the social media #NeverAgain, and its goal is to force congress to take action and give a voice to the students. Ms Murray said that adult participation is welcome, and that she encourages everyone to sign up when registration is made available. During the meeting Newtown Action Alliance member Steve Yanovsky also spoke to the crowd about the group’s initiative with RAWtools, which transforms guns into garden tools. Once the materials are turned into garden tools, he explained, they are being donated to two agricultural schools in New Haven for their gardens. Then food produced in the garden will be donated to people in need at homeless shelters. In addition to supporting programs like RAWtools, members of the Newtown Action Alliance stressed the importance of participating in local and national elections to make change. Many people in the audience agreed and spoke about their personal experiences with voting. One woman who identified herself as a Republican said, “It’s not just a Republican thing, it’s an NRA thing” and that politicians need to be more concerned about voter backing than getting the NRA’s financial support. Another member from the crowd said they think Newtown Action Alliance and individuals should publicly thank Al Hoffman, Jr, a major Republican donor who after the Parkland shooting made national news for saying he will not support candidates or groups that do not endorse renewing the ban on assault weapons. 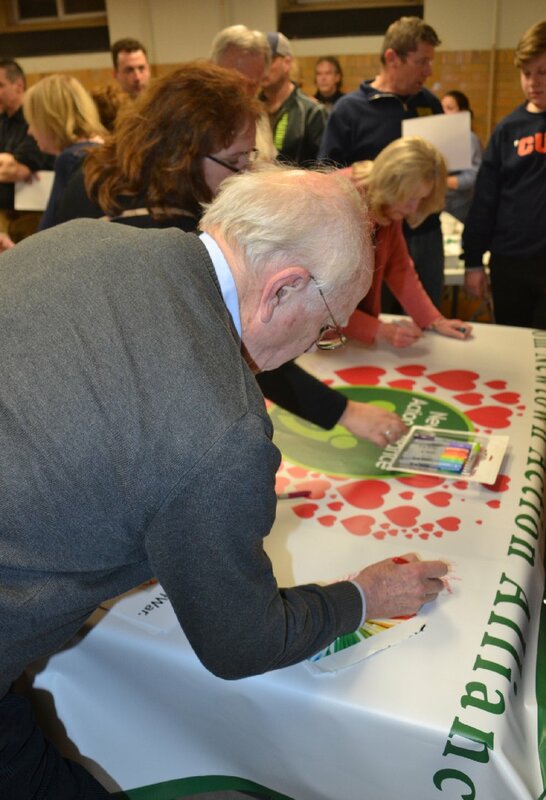 At the end of the meeting, NAA members invited attendees to show their support for the Parkland community by signing their names and offering a kind message on the group’s large banner. For more information about Newtown Action Alliance and Junior Newtown Action Alliance, visit alliance.newtownaction.org.